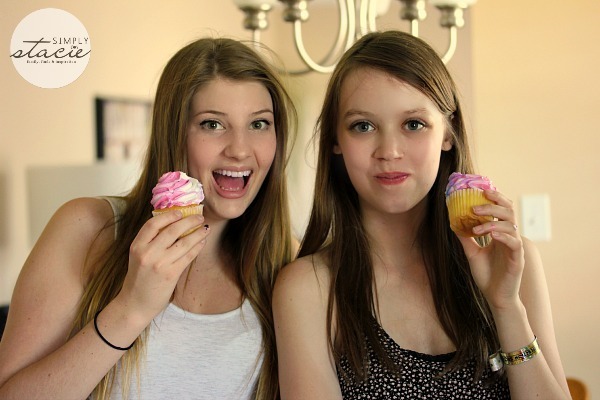 Last month my oldest daughter celebrated a milestone: her sweet 16 birthday. She has grown into a beautiful, sweet and kind young woman and I’m so proud of her. I couldn’t have asked for a better daughter. I wanted to make her 16th birthday extra special this year. It was also her first birthday celebrated in our new home in Pembroke. Olivia wanted to go out to dinner at her favorite restaurant and then have a sleepover with a few friends. I told her she could do whatever she liked! I had a few ideas in mind of how I could make her birthday one she would never forget. Canon USA sent me the Canon PIXMA MG7120 Wireless Inkjet Photo All-in-One printer in June and I’ve already used it for a few projects including this Family Memories Cookbook. 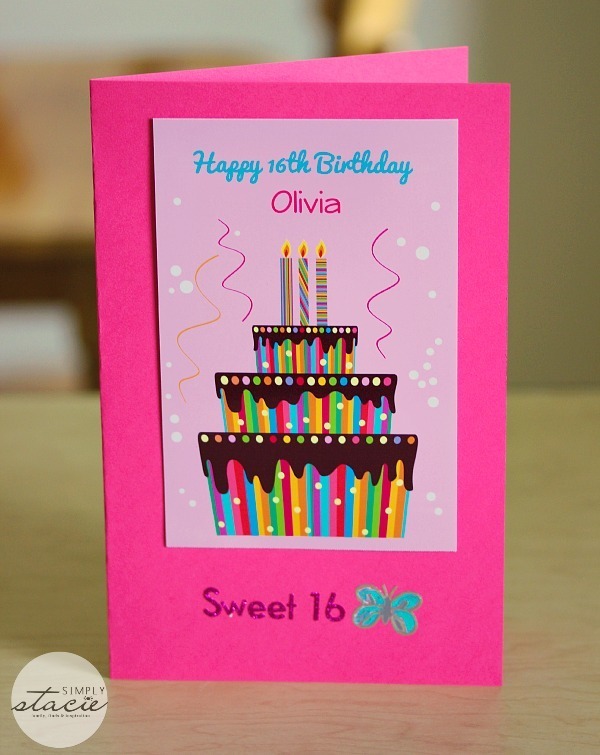 I follow a few party planning blogs and decided to make my own decorations for Olivia’s birthday. Not only would it be less expensive than buying them, but I think they would also be more meaningful if they were homemade. 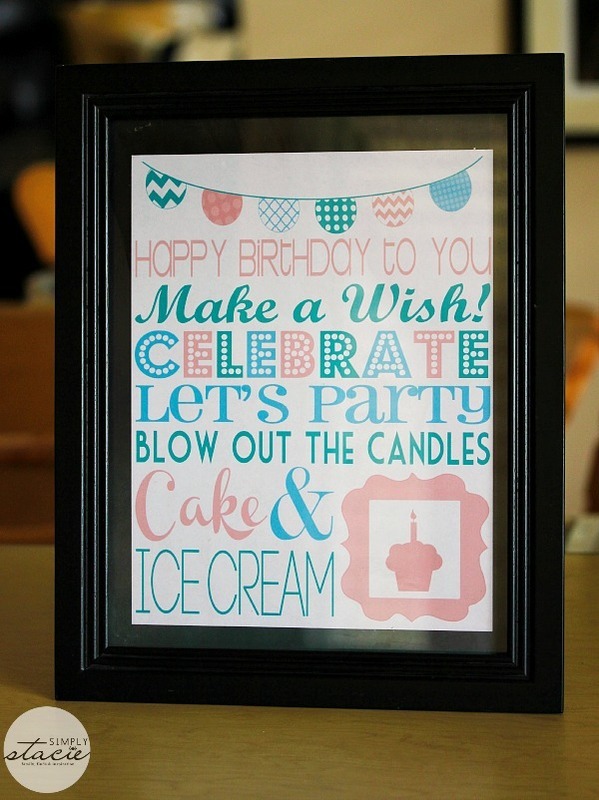 There’s a whole new world out there online in the land of free birthday party printables. Google and you’ll see what I mean! I went through pages and pages of results looking for the perfect birthday party decor for Olivia. I wanted to find something sweet and soft like her. 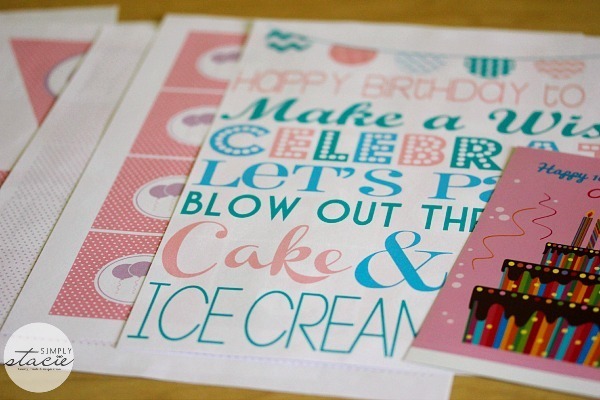 Then I went a little “printable crazy” and started looking for other free ways I could add some personal touches to the birthday decor. Instead of buying a card at the store, I made my own. 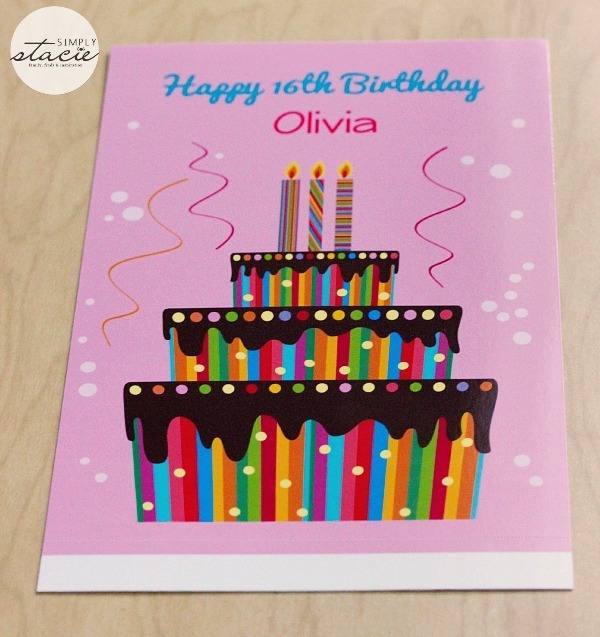 I found some free birthday card templates on the Canon My Image Garden software that came with my Canon PIXMA MG7120. I printed the card on some 4×6 photo paper that I had on hand. Then I folded a piece of pink cardstock paper and glued the photo paper to the front. After personalizing the card with some glittery stickers, I wrote Olivia a personal, heartfelt message inside and let her know how much we all loved her and were so proud of her. I found a gorgeous Birthday Subway Art on I Heart Naptime that I placed inside a black picture frame. I put the frame on the counter next to the refreshments. We also had birthday water bottles! 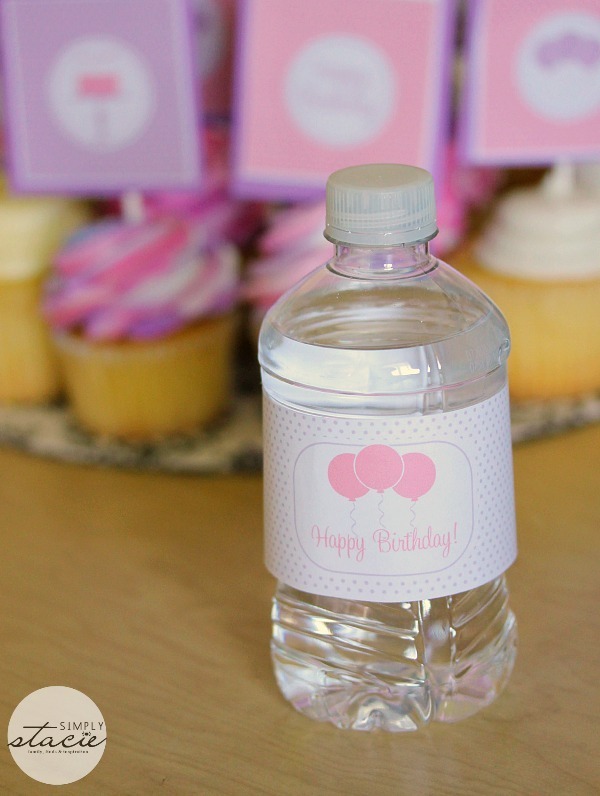 I wrapped a printable water bottle label around each of the water bottles to serve guests. 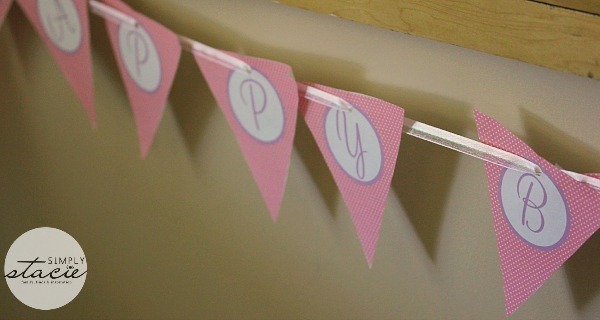 I especially love how the birthday banner turned out! 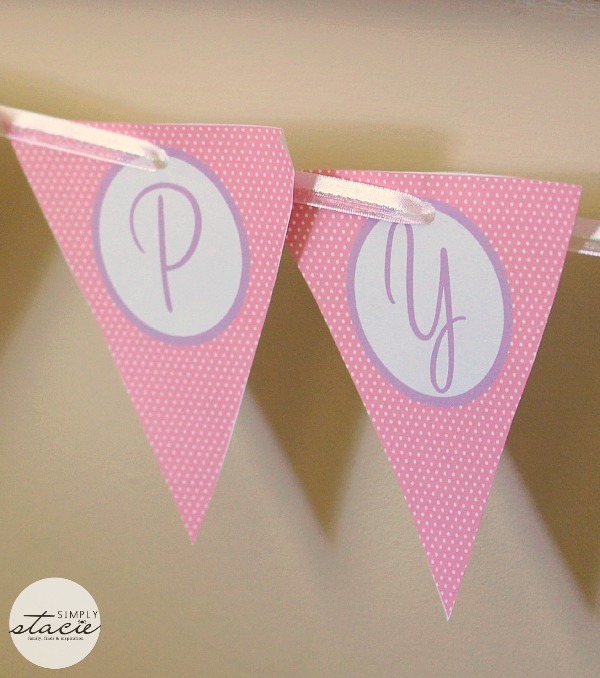 After cutting out each of the pennants, I punch a small hole at the top of each one and using a thin pink ribbon, strung the banner up in the kitchen. I added the balloons at the end to hide the tape holding the banner in place. 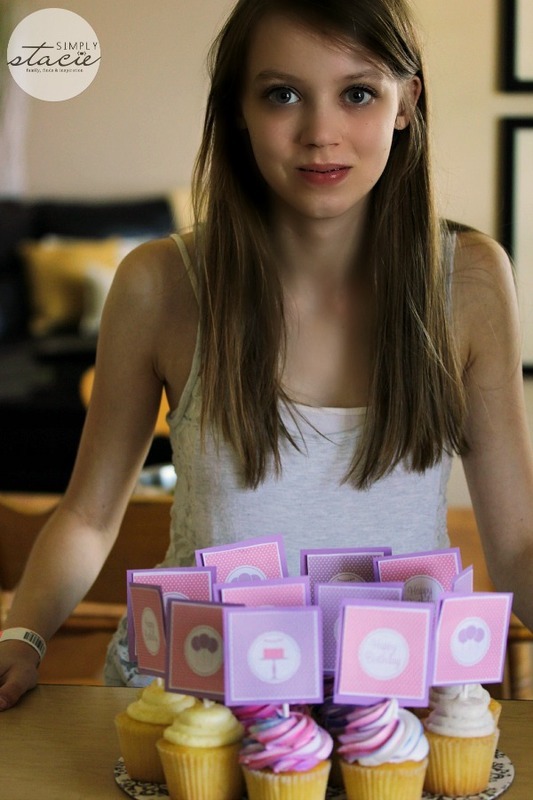 Olivia’s friends all thought I had bought the decorations and were surprised to learn that I made them myself! 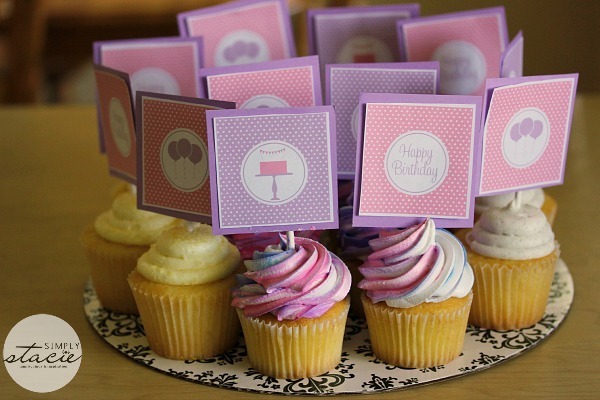 The cupcakes were a hit and the cupcake toppers were my favorite decorative touch. 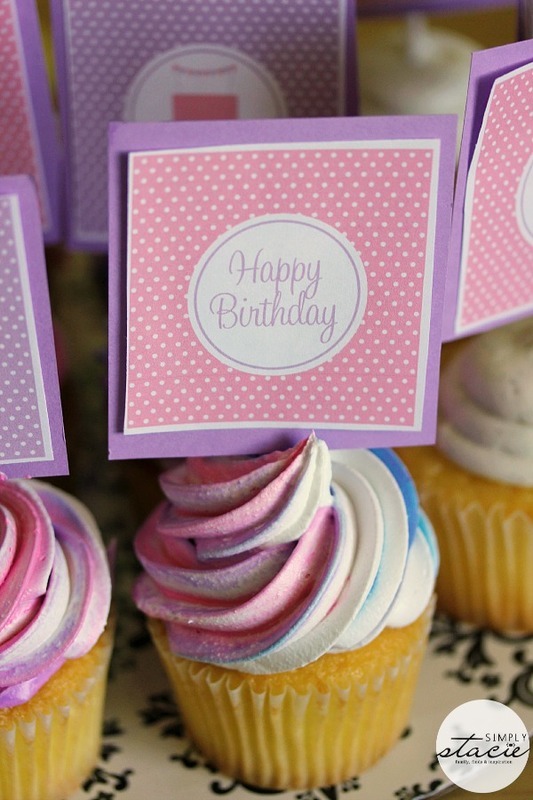 After printing out my cupcake toppers, I glued them on a square piece of cardstock. 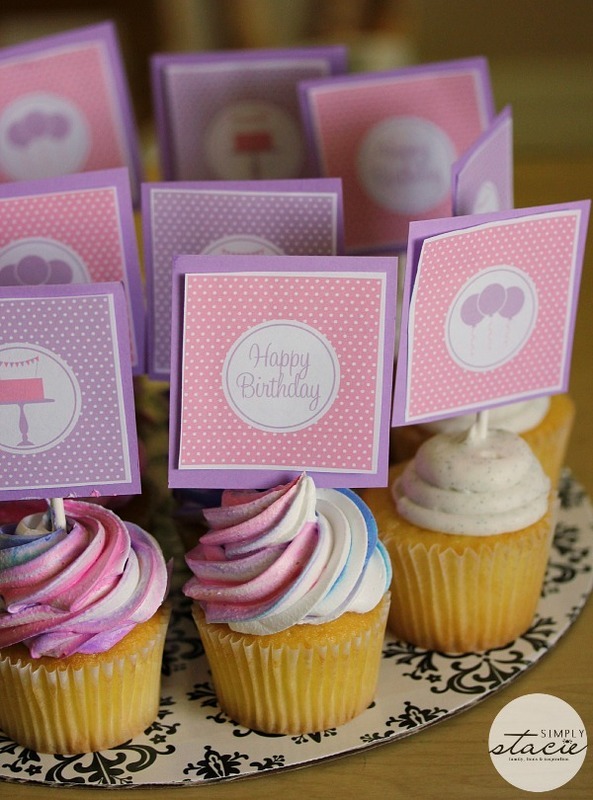 I added a lollipop stick to the back of the cardstock and then simply placed my cupcake toppers in each individual cupcake. I love how pretty they turned out. They did not last long either and were quickly gobbled up by the hungry guests. After her friends left the next day, Olivia thanked me for a memorable birthday. All those little extra touches did not go unnoticed and she said they were perfect. I’m glad she had a good day. You only turn 16 once and I wanted her to remember the day forever. Bridget’s 10th birthday is coming up this October and I plan to create the decor using my Canon PIXMA MG7120. This printer does just about everything except bake the cake! In reality though, it’s such a versatile printer with so many different capabilities. It can print photos, print on CDs and DVDs and I can even use it to edit images right on the Touchscreen LCD. You don’t even need a computer to use it! With the PIXMA Printing Solutions (PPS) app, you can print from anywhere to anywhere. Use the PIXMA Cloud App to print and scan photos or documents from your mobile device. Print from social networking sites like Facebook, Twitter, Flickr, etc and storage sites like Dropbox and Evernote. The PIXMA Cloud App is compatible with Facebook, Flickr, Dropbox, Evernote, Picasa, Photobucket, Canon Image Gateway and Canon Creative Park. The PIXMA Cloud App is really straightforward to use. Once you’ve set up your Canon PIXMA MG7120 at home, download the app through iTunes to your mobile device. 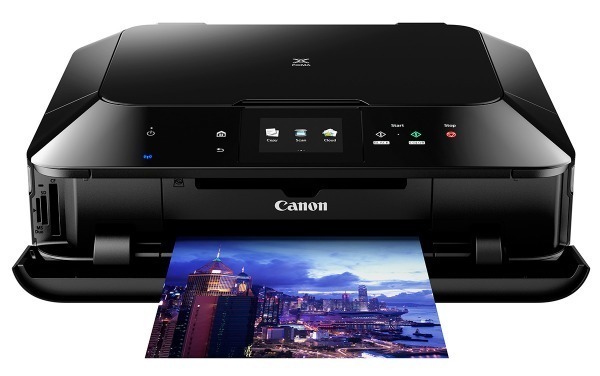 Choose the image or document from your preferred platform and print the selected items wirelessly to your home printer. It couldn’t be any easier! It’s been great for printing photos from my iPhone to use in scrapbooking projects. With back-to-school almost here, I know that we all will getting lots of use out of the Canon PIXMA MG7120. What is your favorite feature? Connect with Canon USA on Facebook and Twitter. This is a sponsored conversation written by me on behalf of Canon PIXMA. The opinions and text are all mine.